Heaney’s Aunt Mary whom he adored as a youngster is the central focus of Sunlight, a lyrical vignette from his early life in Mossbawn that introduces the North collection of 1975. Field of vision recalls the increasingly limited outlook the old aunt was reduced to in her last years. Heaney admired her fortitude and in this poem spends some time ‘seeing things’ through her eyes. Ultimately the stage Mary has reached contributes to young man’s feeling that it will soon be time to leave the family home. Prior to her hospitalization in the mid-70s Mary coped with a long period of immobility in the family home (sat for years In a wheelchair). Silence prevails in her living quarters. Mary’s gaze does not waver (looking straight ahead) as it passes through her window into the visible world outside. Mary follows the changes of the seasons (winter sycamore trees unleafing and leafing at the far end of the lane, shows little daytime interest in canned entertainment (straight out past the TV in the corner), is confined to observing her unvarying Ulster habitat and its climate working off each other – the same wind-dominated landscape (stunted, agitated hawthorn bush) … resilient livestock (same small calves with their backs to wind and raIn) … the same view across grazing land (same acre of ragwort) to the horizon beyond (same mountain). Heaney zooms in on the person she was: the human embodiment of the steadfast solidity and firm in-placeness of her window: her vivacity as bright as the shine on her furniture (brow … clear as the chrome bits of the chair); her long-suffering nature (never lamented once); a tower of strength (never carried a spare ounce of emotional weight). Face to face now with Mary’s memory Heaney describes her legacy (an education akin to a well-braced gate through which the wider world beckons- a scene with a gateway and a beyond … the barrier of solid, dependable design; a lean, clean, iron roadside model between two whitewashed pillars) that describes his community: tough, spotless, conservative. 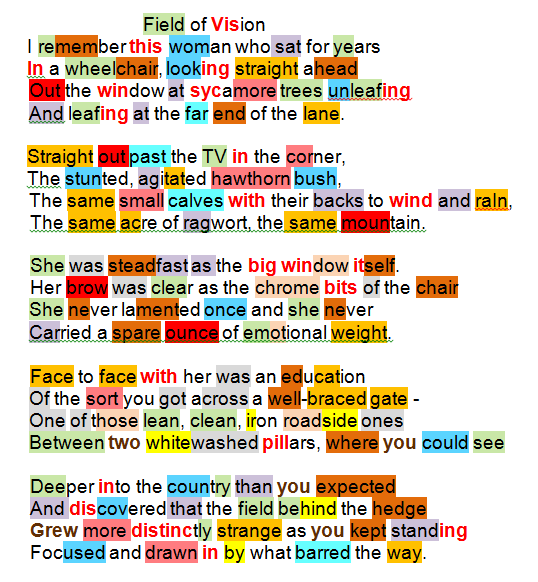 Heaney, pre-University, sees beyond a gap that extends into the distance deeper into the country than you expected, first a familiar field behind the hedge then increasingly different the further ahead he looks (more distinctly strange as you kept standing. He feels the pull (focused and drawn in) – one day soon he will pass through but the moment to turn his back on his early life has not yet arrived (barred the way). Heaney paid tribute to his aunt (DOD 171: There was something in our relationship, whatever it was, that stood still … For years she was crippled with arthritis and eventually had to have her bed brought downstairs into what had been our sitting room … My memories of those years in the 1970s, before she had to go into special care in the Mid-Ulster Hospital, are of arriving with Marie and the kids from Wicklow and greeting first of all my mother and father and sister Ann in the living room, then going in to sit with Mary. Not a lot getting said or needing to be said. Just a deep, unpathetic stillness and wordlessness. A mixture of lacrimae rerum (tears for the situation) and Deo gratias (praise be to God). Something in me reverted to the child I’d been in Mossbawn. Something in her just remained constant, like the past gazing at you calmly, without blame. She was a tower of emotional strength, unreflective in a way but undeceived about people or things. I suppose all I’m saying is that I loved her dearly.